We expected a good landscaping job, but we got more than that!!! We had a house fire and Paul and his crew cleaned up the debris as well. Our new yard is going to be so beautiful in the spring. I can’t wait!! 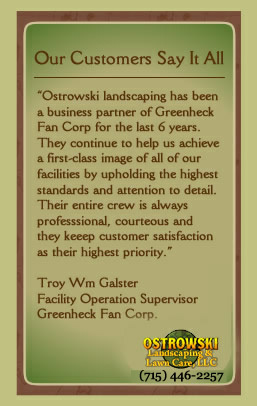 I have gone to Ostrowski Landscaping to install my landscape designs for years. Paul and his crew are hard working, conscientious, cooperative, and creative. Working together, on projects I design, they always do a first class job, paying attention to even the smallest of details. They are a diversified group and can install even the most complicated jobs. It is always a pleasure doing business with them. My customers have wonderful comments about their work. It is a pleasure working with them.